I finally called Seattle Cancer Care Alliance to discuss the less-than-great visit I had in March. Yes, it took me nearly six months and I have no real explanation as to why it took me so long. Friends encouraged me to do so when I relayed my story over these months, and I thank them all – including Twitter friend Mary Beth at Overlake – for the encouragement. She also shared her cancer story via a more public blog earlier this year. SCCA does not currently have an online form for sharing a concern or complaint. On the day I decided to call last month, the patient relations rep was out of the office. The back-up person offered to transfer me to someone in compliance (a person I know through work), but I said I would call back the next day. The next day, I spoke with the rep. She was kind and a good listener. I felt like she said, “I’m sorry” too many times, but perhaps that is part of the training. I stopped her after a few of those and said “thanks,” but really, there is no need to continuing to say “I’m sorry.” She took careful notes and I told her that I didn’t have a problem with my identity being shared. I also told her that what happened disturbed me because of my work in media relations. I talk with patients on a regular basis and help share those stories with the media … and I believe in our system and our physicians and healthcare team, but my faith had been shattered a bit by this experience. The rep told me that at the very least, I would receive a letter and that I might receive a follow up phone call. I felt good just in sharing the long-overdue story and hoped that it would help the next patient. This was a few weeks ago, and at the start of this week, I started to wonder when I would hear back. I’ll probably just get a letter, I thought, given that I had waited so long to call. Then, today, my phone rang and I saw that it was a SCCA connection. But I’ve been working with several staffers there on different projects, and assumed it was one of them calling. “This is Connie Lehman, is this Mary Guiden?” The reason she was calling still didn’t register. I know Dr. Lehman as a big-deal doctor, UW professsor of radiology often quoted in the media. We were on an email string to plan a Twitter chat later this month. Connie was in Uganda, someone had shared, on a trip related to the Gates Foundation and a new clinic opening. Julie Gralow, who is also at the UW/ SCCA had been there a few weeks ago. Dr. Lehman asked if we could chat or set up a time to talk about my recent call. My notes had come her way via one of the medical directors at UW Medical Center. Wow, I thought. My concerns were really taken seriously. She recapped some of what I had shared and I provided some additional details, including that the scheduler was the person who had said one doctor would be there on the day of my biopsy, and then the doctor was not there. Dr. Lehman explained that feedback like mine is important, and was shared with the entire team. She said that they have weekly meetings and that this type of feedback is discussed there, too. She said, “I’m sorry” a few times, but it felt genuinely sincere and heartfelt. I almost teared up a few times, just recalling how scary and horrible the experience was and recapping parts of it for her. I admitted that I might have freaked myself out a bit, too, by reading my medical chart while waiting to be taken in for the biopsy. She said that the technologist or someone on the team should have been talking with me or paying attention to me the whole time. I told her that wasn’t the case, until they noticed that I was crying and that by then, it was too late. She acknowledged the vulnerability that patients feel when having that particular biopsy done, and how someone should talk them through it. Dr. Lehman said that if I ever have any questions in the future that I should contact her. And she said that this is not the way visits typically run. I am hopeful that what I shared will be useful for future patients. I won’t wait as long if there is a next time in terms of a not-great experience. Oh, and I went in just a few weeks ago, too, for a six-month follow up. 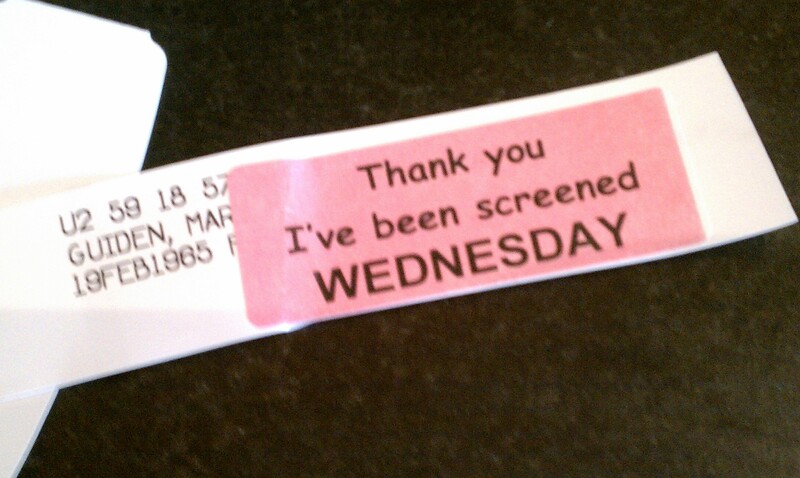 I’m all good, nothing strange to be seen on the mammogram. So I’m good until my next visit and will hopefully then return to once-a-year or whatever the schedule may be.